Get back to basics with one of the most traditional form of security fencing. Here at One Stop Fencing we understand the core need of our customers: security. That’s why we have provided you with the most reliable and durable security systems to give you the peace of mind that your premises are protected. Chain link fencing is suitable for a multitude of different usages ,including sports facilities, commercial and industrial properties, parks and recreational areas, gardens, and also allotments. You can construct a chain link fence around any property, as they are a truly versatile form of protection. Our chain link fencing is woven from galvanised steel wire with 50mm x 50mm spacing. The wire runs vertically but is bent into a diamond formation where each wire overlaps and hooks onto the next wire, creating a robust and sturdy form of fencing. Our chain link fences are supplied in 25m length rolls, which are available in different heights and come in galvanised steel as standard, or in a green finish. The fencing comes complete with line wire which is used for straining and giving tension to the fencing once it is erected. Our chain link fencing can be used in conjunction with either steel, concrete or timber fence posts. To ensure the effectiveness of the fencing once erected, we recommend that the correct fittings are used. 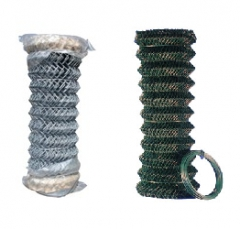 These can all be bought from us alongside any chainlink fencing orders and our members of staff will be happy to guide you through the process. We deliver nationwide, so please give us a call for availability and delivery charges on 01204 578012. Chainlink Rolls 25m – 2.5mm wire dia.